Lynn Good assumed the position of Duke Energy’s chief financial officer in June 2009, amidst one of the worst recessions in decades. In the following Q&A, Good discusses her role in guiding the company through the challenging economy, and shares her outlook for the nation’s recovery. Q: How would you characterize your first six months as Duke Energy’s CFO? 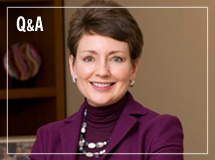 A: Serving as CFO has been both exciting and challenging. When I moved into the role, I immediately faced challenges associated with the economic downturn and the need to manage our costs and capital. Working in my favor was the strength of Duke Energy’s balance sheet, which has served us well during the recent market uncertainty. Q: What adjustments did Duke Energy make in 2009 as a result of the downturn? A: During 2009, we experienced the effects of a downturn so severe, many labeled it “The Great Recession.” On a weather-normalized basis, our customers’ demand for power was down approximately 4 percent, primarily due to double-digit declines in industrial load. As a result, we had to react very quickly by “right-sizing” the cost structure of our business to address economic realities. We raised our operations and maintenance cost reduction target from $100 million to $150 million. We also set a goal to cut our planned capital expenditures by between $200 million and $300 million. I was very pleased that our management team and employees were able to meet both of these goals. We will need to maintain this focus in 2010. We launched a program in the first quarter that enables employees in select functions to voluntarily separate from the company. These and other new initiatives will help us achieve sustainable cost savings. Q: How are changes in the credit markets affecting Duke Energy’s growth plans? A: For many companies, access to credit remains tight. Fortunately, the strength of our credit ratings gave us tremendous access to the credit markets at favorable rates in 2009, when we issued $3.75 billion of fixed-rate debt at a weighted-average rate of 5.2 percent. This access allows us to continue modernizing our generation fleet and making other investments that help us achieve our mission of providing customers with clean, reliable and affordable energy. Q: What is your outlook on the economy over the next year and beyond? A: I believe we will continue to face a challenging economic environment in 2010. Until we see some meaningful improvement in employment levels, it will be difficult for consumers to resume spending. The lack of consumer spending will slow economic recovery. However, I do think we’re seeing signs of stabilization. Hopefully, the worst is behind us. With manufacturing inventories at low levels and continued weakness in the U.S. dollar, there is potential for rapid growth in the industrial sector. Overall, I’d say I am cautiously optimistic about our nation’s prospects for near-term recovery.